Chuq and Emma's Blog: Picking up the pieces ..
A year ago, Australia was the favoured nation to win the right to host the 2022 FIFA World Cup. Two weeks ago, FIFA's technical reports said England, United States and Australia were the three bids best prepared and capable of hosting a World Cup - Russia and Qatar, the most high risk. Yet, on Friday morning, Russia and Qatar were declared the winners, while England and Australia were eliminated in the first round of their respective votes. What went wrong? Frank Lowy stated that before the vote, they were confident that they had at least four votes in the first round - maybe as many as six - meaning at least three ExCo members had looked him in the eye and lied. Even afterwards, two members have claimed responsibility for the single vote. Who can he trust? The number of votes for Qatar and Japan actually decreased after the first round - leading to suggestions that some blocs of members planned to vote in pre-arranged ways in particular rounds, targetting individual nations one by one. USA, Qatar and Australia were the only nations seen as the likely hosts of the event (not to say the other bids weren't good - but too soon after their 2002 hosting). Australia was probably identified as the easiest of the three to "get rid of" early. 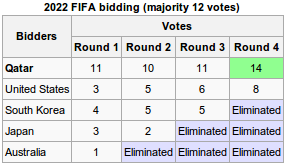 Now for a game of "what-if" ... notice how Japan had an extra vote in their first round as opposed to the second? What if that vote was originally going to Australia but was "switched" to Japan just to knock Australia out, as it was deemed a bigger threat? Japan and Australia would be locked 2-2 for last place, leading to a "knock-out" voting round between the two. A poster on the FourFourTwo Australia forums, girtXc, appears to have some sort of insight into the workings of the FIFA ExCo and has posted an interesting theory. Apparently when the Tahitian delegate Temurii (I'm going to assume people know all about that!) got suspended it had bigger ramifications than just losing a single vote. His theory about the Japan vote is that powerful Qatari ExCo delegate (and Asian Football Confederation chief) Mohammad bin Hammam arranged it so that Japan wouldn't go out in the first round, therefore keeping Japan ExCo delegate Oguru's honour (very important in Japanese culture) and thus ensuring Japan's vote went to Qatar after Japan was knocked out. Talk about swings and roundabouts! The theories about how it happened can go on forever, and we may not ever know... but what happens from here, for Australia? The sad thing about losing is that, as well as not hosting, it makes the moronic anti-sockah brigade in this nation think they have the right to spout rubbish about the sport. Rebecca Wilson is already at it. I won't go into detail about this one, if you read it, you know about it, and if you don't believe it happens I'm not going to change your mind. The corruption has hit several major nations hard - the USA and England are even discussing a breakaway governing body to FIFA. Australia could potentially be a part of this but we don't have the standing to do so - any form of dissent and the AFC - headed by bin Hammam (conflict of interest much?) - will send us back off to Oceania. When will Australia get another chance? The disappointing thing is that these opportunities come up so rarely for Australia. FIFA has had vague continental rotation policies in the past - usually the rules are changed before a full cycle occurs. With the 2018 and 2022 bid process, the rule was that once a continent hosted, they were not able to bid for the next two. Although it is possible that this will change in the future, if it continues, then 2026 would likely go to the USA, and 2030 to Europe. That puts Australia's next chance at 2034 at the earliest. I will be 56 by then. Frank Lowy would have well and truly fallen off his perch - he will be 104 if he makes it that far! ... and the big question is - will the government at the time support it? We were lucky in that we had bipartisan support from Kevin Rudd (a "foreign affairs nerd prime minister") and Malcolm Turnbull. It may not be that easy for a government to fork out $45m again, depending on the political landscape at the time. But then again, in 1986, Melbourne unsuccessfully bid for the 1992 Olympics. 11 votes out of 85 in the first round. Brisbane bid for the 1996 Olympics, 12 out of 86. Imagine if those two experiences were derided as being "wastes of money" - it may have stopped the AOC supporting Sydney's bid for the 2000 Olympics - 30 votes out of 88 in the first round, defeating Beijing 45-43 in the final round, and going on to host the "Best Olympic Games ever!" In the meantime, lets support the Socceroos at the 2011 AFC Asian Cup - strangely enough, hosted in Qatar in January - after all, it is the game on the pitch that matters! This entry was posted on October 4, 2009 at 12:14 pm, and is filed under football, worldcup . Follow any responses to this post through RSS. You can leave a response, or trackback from your own site.